If you were lucky enough to witness the television debut of Micheal Jackson wearing a single sequined glove on his left hand during his stunning performance of "Billy Jean" at Motown's 25th anniversary TV special in 1983, we’re betting that it’s still a moment that you - and the world - will never forget! Not only was it one of the most knock-out performances the pop music industry had ever seen, within the span of 5 minutes, that single glove became an iconic part of the King of Pop’s wardrobe for the rest of his career. 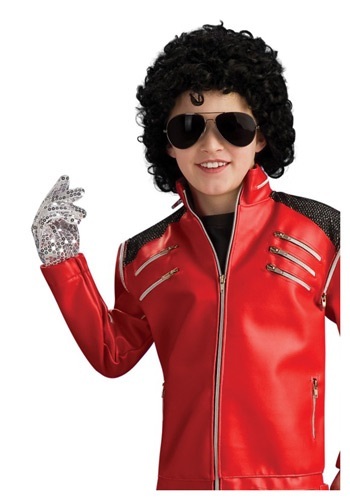 So if your kid can’t get enough of MJ’s music, turn this Halloween into a real life “thriller” by getting him the accessory that is synonymous with the King of Pop! This detailed Child Micheal Jackson Glove adds the perfect finishing touch to any Michael Jackson costume! Approximately 6 1/2" long, the glove is 100% white polyester for a comfortable fit, and covered in silver sequins for that authentic MJ look! now who’s “Bad”? !